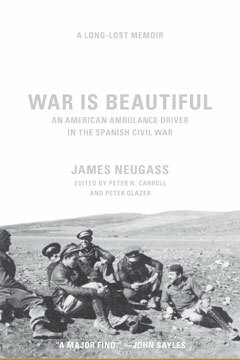 Although rumors persisted over the years that Neugass had written a memoir, the manuscript of War Is Beautiful, a nuanced and deeply poetic chronicle of his service as an ambulance driver, did not come to light for sixty years, until a bookseller discovered it among papers in a New England house once occupied by the radical critic and editor Max Eastman. The memoir combines fast-paced accounts of darting onto battlefields to pick up the wounded with elegiac renderings of days spent “on alert” in an ever-changing series of sharply observed Spanish towns, enduring that most difficult of wartime activities: waiting. Published now for the first time, War Is Beautiful is poised to take its place alongside works by Erich Maria Remarque, Irène Némirovsky, Wilfred Owen, and George Orwell as a transcendent contemporaneous rendering of wartime life. It includes some of Neugass’s own photos taken while in Spain.